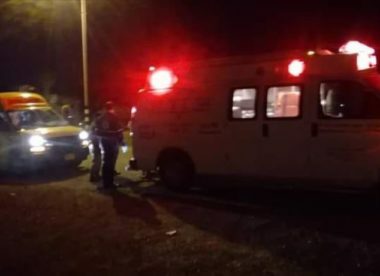 [Tuesday, December 3, 2013] Palestinian medical sources have reported that one resident was injured, with several suffering the effects of tear gas inhalation, after dozens of soldiers invaded Kofur Qaddoum village, near the northern West Bank city of Qalqilia.The sources said that Ahmad Eshtewy, 22, was shot in the arm by a gas bomb fired by the soldiers, while dozens of residents have been treated for tear gas inhalation. The soldiers also kidnapped Ghaleb Hilmhy Eshtewy, 23, and took him to an unknown destination. Coordinator of the Popular Committee against the Wall, Morad Qaddoumy, stated that the army has been targeting the village in an attempt to stop its ongoing protests against Israe’s illegal annexation wall and illegitimate settlements. He said that, after the villagers started their massive weekly nonviolent protests two years ago, the Israeli military escalated its ongoing assaults, with its collective punishment policies targeting civilians and their lands. On Tuesday evening, soldiers kidnapped Ahmad Khalil Jaradat, 23, at a military roadblock on the Jenin-Haifa road. Jaradat is a student of the Arab American University in Jenin. He was stopped and interrogated at the roadblock for more than an hour before the army took him to the Salem military base, north of Jenin.